​The White Buffalo began releasing full studio albums in 2002 with Hogtied Like a Rodeo. The release was followed with The White Buffalo E.P. Throughout the remaining early years of the 2000’s, The White Buffalo toured and developed a fanbase, honing his skills in blending the Folk, Country, and Roots of his songs. He revisited his debut in a friend’s living room, releasing Hogtied Revisited in 2008. Beginning in 2010, The White Buffalo began a consistent run of releases and high profile music placements for shows such as Sons of Anarchy which featured multiple cuts from the singer/songwriter. The White Buffalo recorded Prepare for the Black and Blue in six days, releasing the E.P. in 2010, following with another digital E.P. release in 2011 with Lost and Found. Returning to full albums, The White Buffalo released Once Upon a Time in the West (2012), Shadows, Greys, and Evil Ways (2013), Love & The Death of Damnation (2015), and his recent release, Darkest Darks, Lightest Lights. 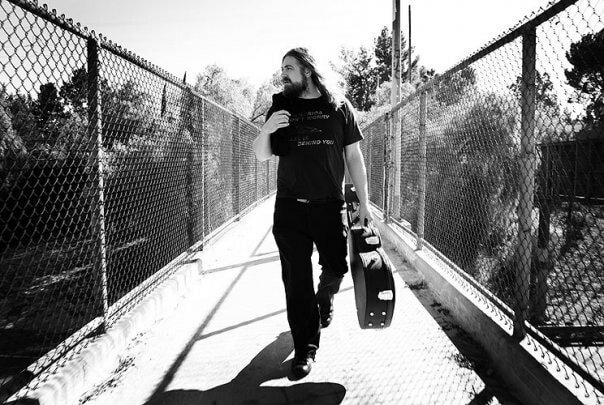 Over the course of his career, Jake Smith aka The White Buffalo has let his words and music offer the clearest picture of the artist creating the songs. With a steady slate of album releases, and his music heard in film and television shows, The White Buffalo remained a personal mystery, his baritone vocals guiding his stories through multiple albums and his stature commanding stages. Jake Smith took a moment to speak with us about his music, giving more understanding of the man inside The White Buffalo. The Alternate Root (TAR): You were born in Oregon and grew up in Southern California? The White Buffalo (TWB): My family moved to Southern California when I was about one year old, so everything I knew came from there. In the midst of punk rock, I was a SoCal middle school kid into Country music.. that did not make me very popular. Country music came from my parents, who were huge country music fans. I think my music today attracts the fringe people with a mix of country, folk, punk. TWB: Shadows, Greys, and Evil Ways was the only album I wrote that was a concept about just one man. I have one song on new album (Darkest Darks, Lightest Lights) that is about Richard Ramirez (The Night Stalker) and the paralyzing fear he created for me as a child. I weave myself into the song. A lot of my characters are conflicted, things are not always black and white in real life, or in my songs. I like to think I write small human stories. TAR: How did you come to have so many songs in Sons of Anarchy? TWB: I didn’t get music into Sons of Anarchy until around the third season, I think. My lawyer knew the music supervisor, this is before I had a manager. He set up a lunch with Bob Thiele (music supervisor for Sons of Anarchy) and said I work with an unsigned artist that I feel would work great in Sons of Anarchy. For the closing song in the final episode, Kurt Sutter wrote the words, and I wrote the music with Bob Thiele, and, of course, I sang it. It wasn’t supposed to close the show but they fell in love with it. I like how Sons of Anarchy used music as part of the story line. A lot of the conflict in my songs is the same that the characters on Sons of Anarchy experience. They are bad guys but they are still conflicted about their actions and still human. TAR: Does your ability to blend genres in your music help with a wider audience for touring? TWB: Mixing folk and roots is a curse and a blessing. It makes you an island. I haven’t explored the southern states in the U.S much for touring. I do well in the UK and Germany. The fans seem to treat music as a little less disposable. TAR: You have a new video series, In The Garage. What is that about? TWB: In the Garage is a web series. It is new. I wanted to play around. People assume that I am this really mysterious guy, and I wanted to change that. We talk about new ideas, and I play a song. The music is very stripped down.